And welcome back to the third part of this 10-part series on G1 (Generation 1) Transformers by MB, where we have a look at everything you would want to know about this line (and perhaps a lot more) including a lot of information about the background against which this line was introduced in Europe in 1985. In the previous two installments we had a look at the history of the Milton Bradley Company and its takeover by Hasbro in 1984. We then had a look at what was going on in Europe that same year with pre-Transformers under the name of Diaclone that were being introduced by Ceji Joustra and Gig. Now we’re starting to get to the gravy; the proper introduction of Transformers in Europe! We’ll have a quick look at the differences between 1984 and 1985, i.e. which company is selling what and where. Then, we’re going to dive straight into the MB line. In this chapter the most important two questions I will try to answer is what and when. 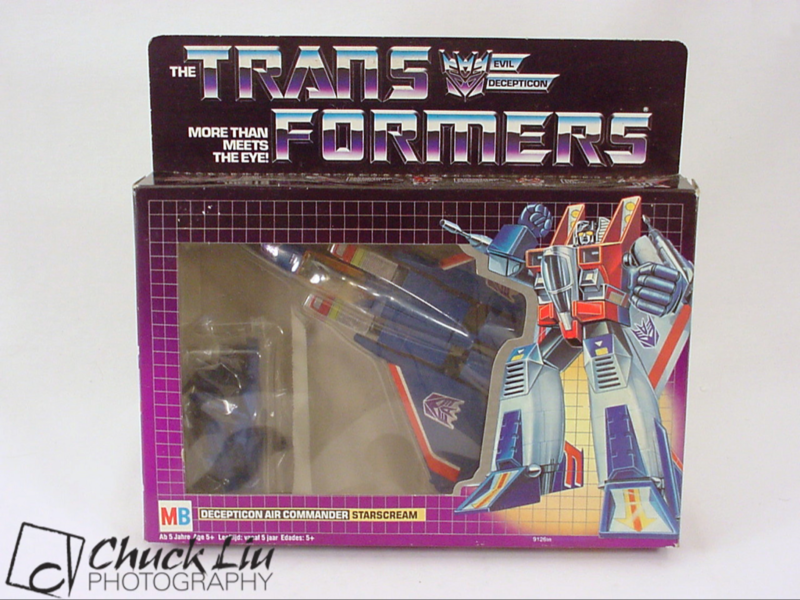 “What”, as in which Transformers were part of MB’s line up and “when”, as in when did the line make its first appearance in European toy stores. Ready? Read on! First of all we see that Hasbro UK is still active in the UK selling Transformers as they did in 1984. In Italy GiG is still at it, although they have dropped the Diaclone line as they were probably strong armed by Hasbro into taking out a Transformers license! A newcomer in Greece under the name of El Greco, a company that has also licensed the Transformers brand and has released a small selection of Transformers toys in Greece. Takara has stopped selling Diaclones in Finland. But what is perhaps the most striking of all is that Joustra has completely disappeared from the map! The territory that was previously covered by Joustra is now completely owned by Milton Bradley…. and then some. Spain and the Nordic countries have been added to the list. MB now covers nearly all of western Europe. Let’s take a look…. So what happened here? The really juicy details of what happened with Joustra will be examined in the next installment. For now we can observe that MB has moved in on Joustra’s territory and has started selling genuine Transformers. But why MB and not Hasbro? Well, as we have seen in the first installment of this series, Hasbro had taken over MB a year earlier (in 1984). This opened up new possibilities for Hasbro for the European market. 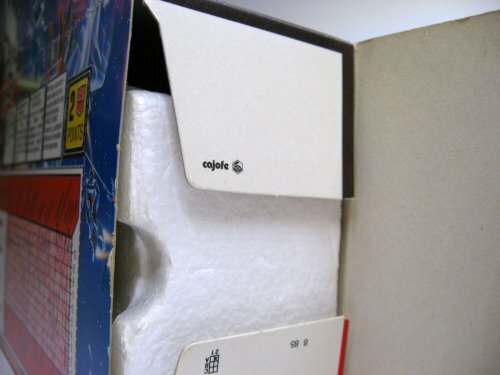 Hasbro did not have any European offices before they assimilated MB. They suddenly had major success selling their new Transformers brand in 1984 in the U.S., Canada and the U.K., where they already had a presence, but in order to sell Transformers in Europe they would have had to either open up offices in various European countries or find European distributors, who were willing to sell their Transformers and work with them. Fortunately for Hasbro, that was not necessary. MB was a major player in Europe with a total of 9 European offices in various countries and a working distribution network that covered a large part of Europe. Hasbro could now leverage MB’s presence in Europe to introduce their Transformers here without having to share the cake with anyone. 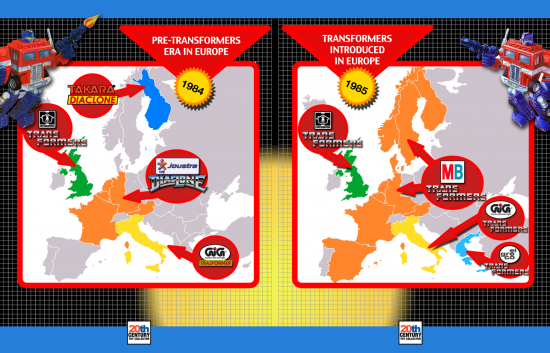 Instead of only using MB for their distribution network Hasbro also decided to use the MB brand to introduce the Transformers to European toy stores. 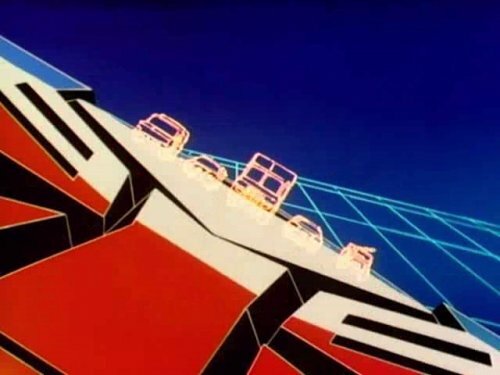 The most likely reason why they chose to brand Transformers with an MB logo instead of a Hasbro logo is because Hasbro was virtually unknown in Europe in 1985. MB on the other hand was a household name, because of their decades long presence in Europe. 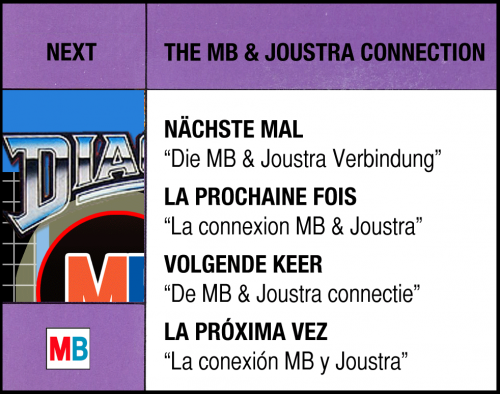 Although Hasbro undoubtedly had plans for the expansion of their own name into Europe, I think they probably felt it was best to use an established name like MB this early in the game. We’ll be taking a closer look at the line up a little later on, because now I’d like to investigate the ‘when’ for a minute! Specifically I would like to know around what time in 1985 did MB release Transformers in Europe? Well, it’s very hard to pin point the exact month or period in 1985 when the first MB branded Transformers were laying in the shops, but by looking at factual information and surrounding events in Europe around that time, we can probably make some educated guesses! Before I do that I want to clarify something about the two waves that MB released. Although we’ll see that there’s a clear distinction that we can make between 2 waves of Transformers that were released by MB, this does not necessarily mean that the nature of the division between these 2 waves is purely a chronological one. Although I personally do believe that most of the second wave MB Transformers were released after the first wave, there will undoubtedly be some examples of certain Transformers from the first wave appearing in toy stores later than some of the Transformers of the second wave. Even further complicating matters is the fact that Europe is not one single country as the U.S. is. Although MB covered several European countries and all their Transformers sport 4 different languages on their packaging, this does not automatically mean that all MB Transformers were available in all the European countries covered by MB at the same time. Some Transformers might not even have been available at all in some countries! You have to take into account national safety guidelines of the various European nations (what was deemed safe in one European country in 1985 might not have been deemed safe in another), logistical issues, inventory issues and other real life problems that come into play when you talk about international distribution of consumer products. Phew! Keeping the above in mind, let’s look at some of those surrounding events that I mentioned earlier that will allow us to make more specific estimates about the period in 1985 when MB released their first Transformers in Europe. Just like most kids in the U.S., most kids in Europe in the mid-1980′s got introduced to Transformers through their favourite pastime: watching television!!! A good way to gauge the approximate appearance of the first Transformers toys in the shops is to find out when Sunbow’s Transformers cartoon first aired in continental Europe. 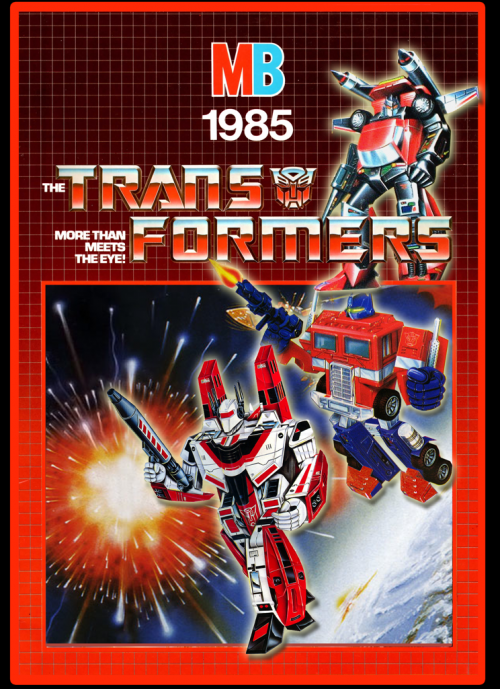 By far the largest part of Europe was introduced to Transformers in the fall of 1985 through Sky Channel, a now-defunct pan-European satellite television channel. 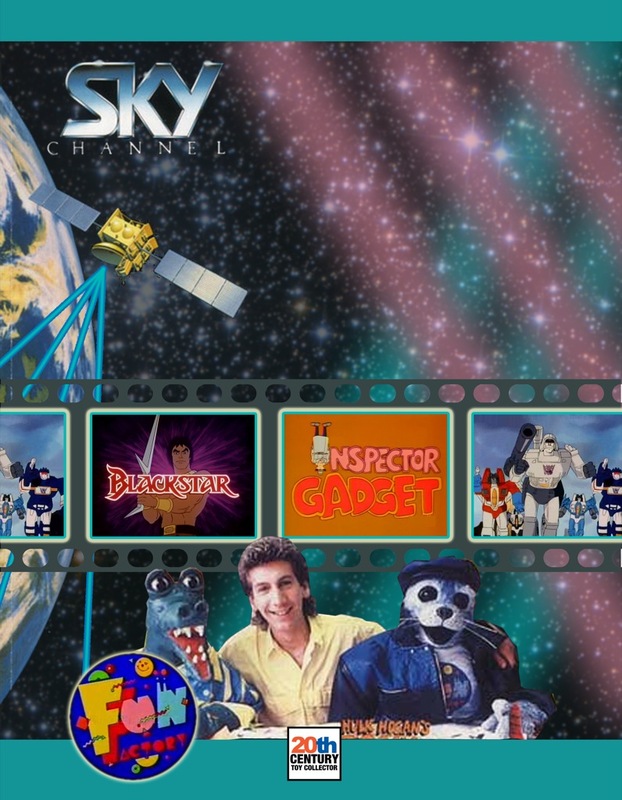 Sky Channel was the European equivalent of what is in the U.S. called a superstation. The 1980′s were very exciting times for television in Europe. Up until then most Europeans only had access to a handful of TV channels, most of which were state owned public broadcasters. That status quo was disrupted in the first half of the 1980′s with the advent of privately owned, commercial TV channels transmitting via satellite to the whole of Europe. Sky Channel was a true pioneer in this respect as it was founded in April of 1982 under the name of Satellite Television plc. It was taken over by Rupert Murdoch’s News International conglomerate and rebranded as Sky Channel in early 1984. Sky Channel’s programming consisted of lots of music videos in the afternoon, reruns of cult 60′s and 70′s US syndicated TV series, WWF wrestling(!) and… kids programming! Before the advent of Sky Channel, kids television was not that big in most of Europe. Sure, you had your cartoons and stuff, but the concept of Saturday morning cartoons was alien to most European kids. Toy manufacturers like Mattel have often lamented this lack of kids programming blocks and subsequent possibilitiy of airing commercials for their toys in Europe. 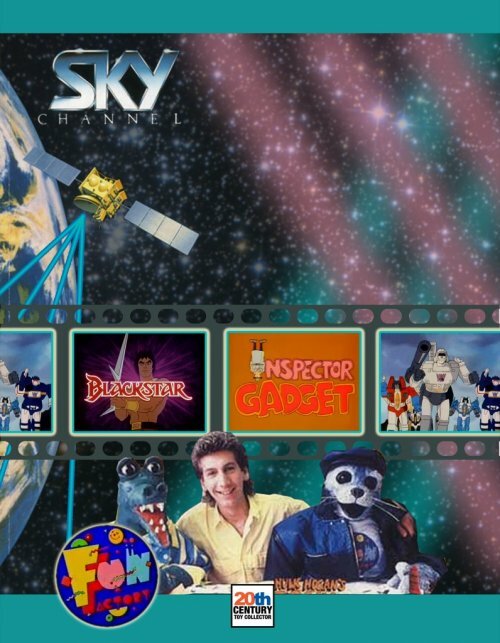 Sky Channel saw an opportunity and started preparations in early 1985 to create a show specifically for kids, which would broadcast lots of cartoons. And so it was that on Saturday the 20th of July 1985 at 8 AM CET a show called Fun Factory premiered. Fun Factory showed 4 hours of back-to-back cartoons, intermixed with small segments by the show’s host and his two puppet co-hosts; a seal and a crocodile. Nothing like that had ever been seen before in most European countries. Over time European kids were introduced to He-man, Inspector Gadget, Jayce and the Wheeled Warriors, M.A.S.K. and of course…. the Transformers!! My personal recollection of the Transformers cartoon on Fun Factory is that the show probably first aired somewhere around September or maybe October of 1985. I was visiting our neighbours one good weekday afternoon after school in 1985 and they had a brand spanking new television set with teletext! (For U.S. readers who might not be familiar with teletext; it’s a system that’s been in use in most European countries since the 1980′s and is a text based information service that was broadcast along with the PAL signal of a European television channel. It typically provided news, weather, TV listings and overlay subtitles, much like the closed captioning system in the U.S. It’s very retro and still in use!) On that specific weekday my neighbour proudly showed me some teletext pages of various cable channels and I was amazed. I asked him whether Sky Channel carried a teletext signal and he showed me Sky TEXT! Of course the first pages I asked him to pull up were Saturday’s TV listings for Fun Factory. And there it was, the complete listing of every individual cartoon on Fun Factory! Our crappy paper TV guide only listed Fun Factory itself and did not go into such detail. What also caught my eye immediately was that there was a new show scheduled during Fun Factory at 11:30 AM CET; The Transformers! The reason I was excited was because I remembered having seen Transformers toys in my local toy store before. I had never given these Transformers toys much attention up until then, because I was really into He-Man at that time. Still, the He-man cartoon got me hooked on He-Man toys, so I thought I might as well check out this new Transformers cartoon and see what happens! Next thing I did is tell all my buddies at school the following day about the impending broadcast of the Transformers on Fun Factory. We all watched that broadcast on Saturday morning, which was “More Than Meets The Eye - Part 1″. After Fun Factory finished, at noon, we would always go outside to meet up and play. On that very Saturday afternoon after the first broadcast of Transformers, it was all we could talk about all day….and many more days to come. Hope I’m not boring you by indulging in a little personal nostalgia like this. Stuff like this is engraved in my brain. If anything, it illustrates how much of a nut I was back then about Transformers. Anyway, let’s get back on track! Although I can’t recall the exact date when this first broadcast of Transformers occurred on Fun Factory, it must’ve been somewhere around September or October 1985. 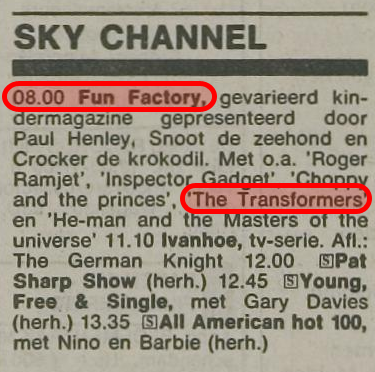 Unfortunately all the Dutch TV guides and newspapers of that era did not carry detailed listings of all the cartoons that were broadcast on Fun Factory, but I did find a newspaper that showed Transformers being aired on Saturday November 2nd 1985, so it was at the latest being aired by then on Sky Channel. TV listings for Sky Channel Saturday November 2nd, 1985. Newspaper clipping from Leidsche Courant newspaper of November 1st, 1985. While Sky Channel catered primarily to the Netherlands, Germany and the Nordic countries at that point in time, the French preferred their television dubbed in French. In France a new pay-TV channel had been launched a year earlier (in 1984) called Canal+. 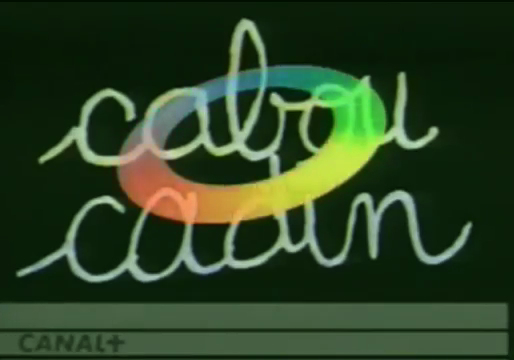 A children’s program not unlike Fun Factory on Sky Channel was aired on Canal+ called Cabou Cadin. 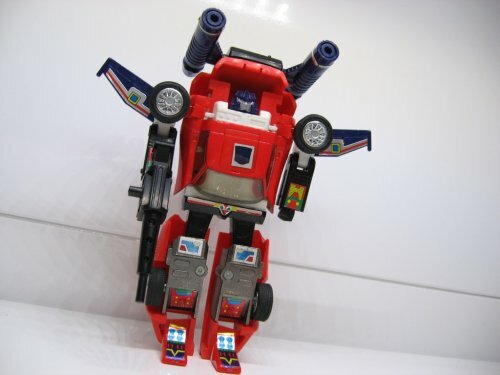 It was Cabou Cadin that introduced French viewers to Sunbow’s Transformers cartoon (dubbed in French) in June of 1985, according to records on French 1980′s nostalgia websites. So what does all this say about the availability of MB Transformers in European toy stores? Well, as far as the Netherlands is concerned it must have been somewhere around the end of summer, or beginning of fall 1985 going by my own recollection. Still, the fact that Canal+ started broadcasting Transformers from June might indicate that MB had released Transformers in France even as early as then, which might not be so surprising, because we will find that France played an important role in the manufacturing and distribution of Transformers in mainland Europe in 1985 and 1986. A pretty safe bet is that by October 1985 Transformers were readily available in France, because if we dig into the archives of the French National Audiovisual Institute we find that MB has aired two commercials on French television on October 1st 1985; a commercial for Optimus Prime and a commercial for Megatron. Records show that the commercials were from a company in Le-Bourget-du-Lac, France, which was the address of the French offices of MB in 1985. I’ve included both commercials below. Check them out! 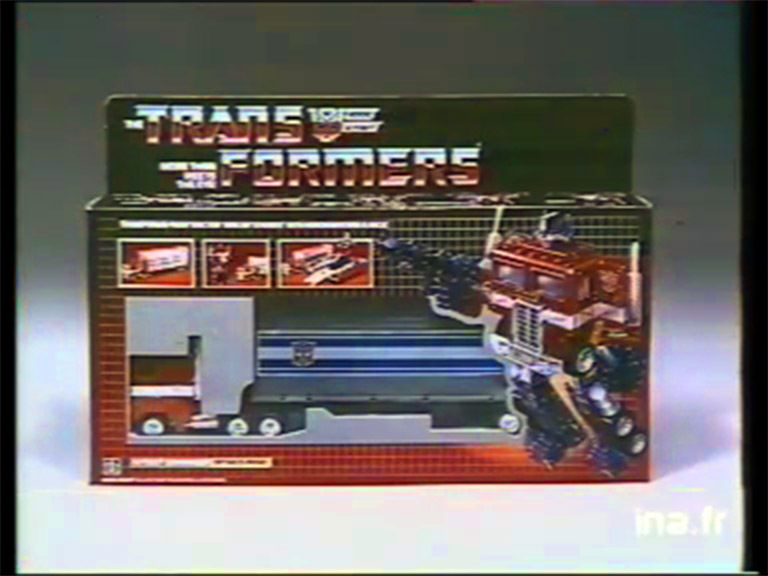 Most of the commercials’ content is taken from the U.S. commercials for Optimus Prime and Megatron, but the end screen of both commercials, showing the toys in their packaging is what is most interesting, because it is unique to these French commercials! First of all, here’s a screen capture from the Optimus Prime commercial. As you can see from the screen capture above, this is Megatron inside his MB packaging! To my knowledge this is the only television commercial anywhere that shows a Transformer in MB packaging. Interesting, isn’t it; why is Megatron shown in MB packaging and why isn’t Optimus Prime? On the top flap you can clearly see the Cajofe logo, but if you look closely at the lower flap you see the number “8 85″ upside down. This translates, of course, to August 1985. I’ve noticed this on all the packaging that was printed by Cajofe. What does that mean? Well, although we’ll never know for sure until an ex-Cajofe employee can confirm this, an educated guess would be that August 1985 is the month in which Cajofe printed this Prowl box. All of the Autobot cars and Megatron have a date code of August 1985. MB Optimus Prime has a date code of September 1985. It’s a reasonable assumption that these Transformers were available at retail not very much later than the date code on the box. Perhaps a month or so later, depending on the country or region. Sunbow’s Transformers cartoon premieres in France in June 1985 on Canal+’s Cabou Cadin. Sunbow’s Transformers cartoon premieres Europe-wide in the fall of 1985 on Sky Channel’s Fun Factory. 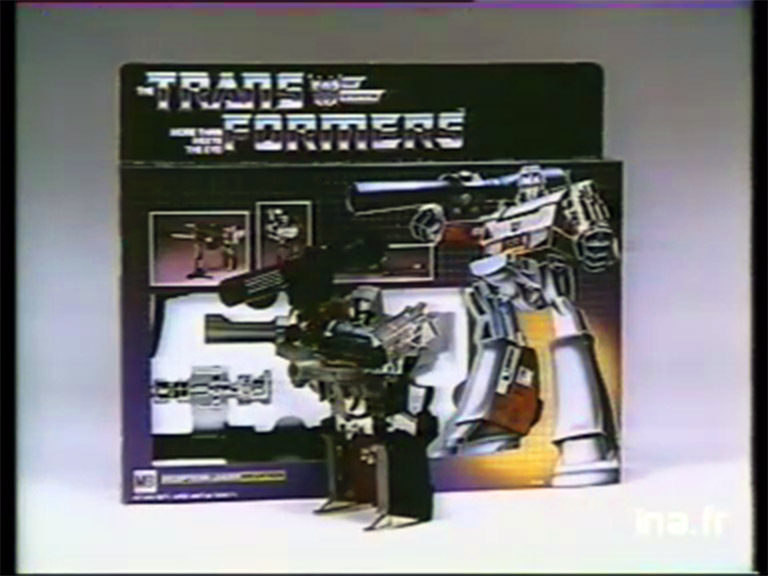 Commercials for MB Transformers Megatron and Optimus Prime premiere on French national television in October 1985. Date codes on several MB Transformers’ packaging show August and September 1985 as presumed months when this packaging was printed. I’m sure you can see that it’s nearly impossible to give an unequivocal single answer to the question when the MB line exactly premiered, but if I were to hazard a guess, I would say that most of the Transformers from wave 1 will have been available from July 1985 or so. Then, most of the Transformers from wave 2 will have started appearing in the shops from October 1985. Again, depending on which country you lived in, you might have seen some of these earlier or later or even not at all! Now that we’ve answered the question of “when” to the best of our ability let’s go back to the “what”. As I mentioned earlier, the first wave that MB released consisted of 36 Transformers; 15 Autobots and 21 Decepticons to be exact. These were available for retailers in 15 different assortments. What’s an assortment? Well, I’ll be taking a very close look at all the various assortments that MB released in a future chapter, but for now it’s enough to know that it’s how a product line is divided into groups for distribution purposes. An assortment will usually also be logically grouped, e.g. there was an Insecticons assortment, a Constructicons assortment, a Dinobot assortment, etc. Ordering, say, an Insecticons assortment would mean a toy store would get a big factory case/box full of Insecticons from its MB distributor. Some of the bigger toys were usually part of an assortment all of their own, like Jetfire, Megatron or Shockwave. Each assortment has a unique number, which is found in catalogs and is usually also printed on the packaging of the product. As you can see it’s not just Optimus Prime who is missing from the Autobot side. How about every single Autobot car? 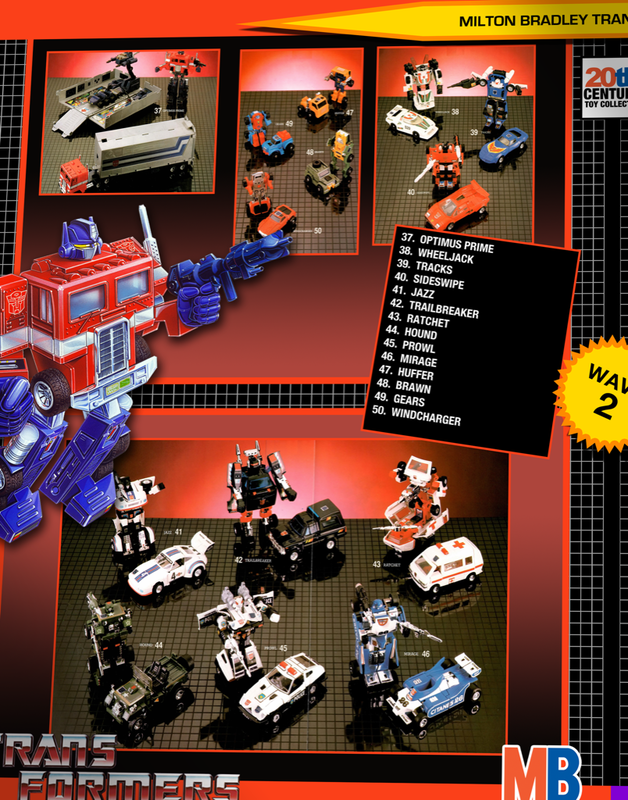 Isn’t it rather ironic that the Autobot line up includes virtually no automobiles? There’s just Roadbuster, who’s a deluxe vehicle and Beachcomber, who’s a mini vehicle. The rest is all planes, dinosaurs and…. I don’t know what the Jumpstarters are supposed to be. There may be only three additions to the Decepticon side in wave 2, but what wonderful additions they are! The plotting traitor Starscream has been added to the line up, which is officially the only of the original three seeker jets from the 1984 U.S. lineup to see a release in the MB line (Thundercracker saw something of a release as a packaging variant — more on that later on). Also, two other equally heavily featured characters were added to the line up in the form of Decepticon cassettes; Laserbeak and Ravage! So how did I come to the conclusion that this was a different, second wave? Well, I base this on the fact that none of the wave 2 Transformers ever appeared in any of the original MB catalogs, except for the MB dealer/trade catalog, where they were included in a supplement. A supplement is what is usually added to catalogs at the last minute, after the original catalog has already been sent to the printer or has already been printed. 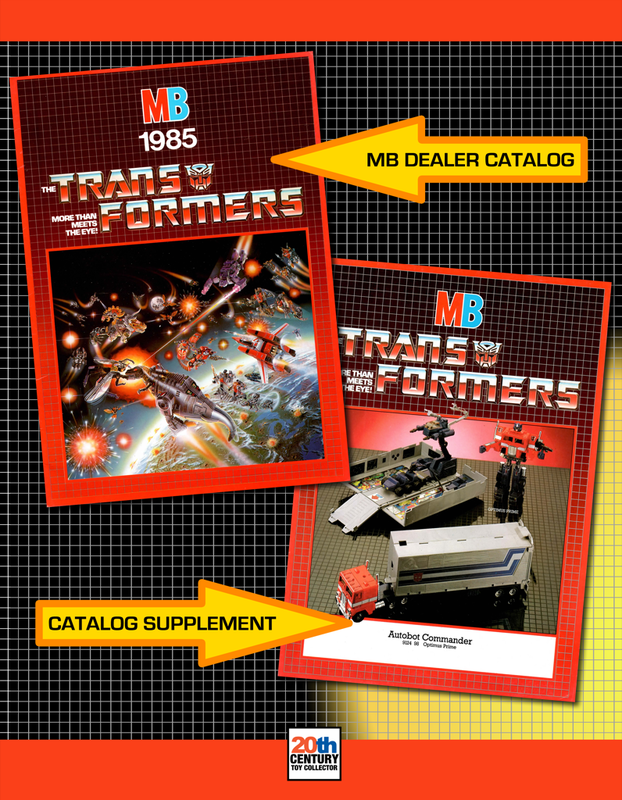 The MB dealer catalog originally only showed the Transformers from the first wave, exactly like all the other catalogs that were available for the MB line. A supplement was created later on and this supplement contains new additions to the line, i.e. what we can now refer to as the second wave. So what does that tell us? Well, it tells us that at the time all the promotional material for the MB line was originally printed, there were either no plans for more Transformers to be released in 1985 besides just the initial 36 of the first wave, or that there was a second wave planned, but MB at that point was not sure yet about which Transformers would be included in that wave, nor did they know when it would be released. A future chapter of this article series will be dedicated to all the promotional material that was released for the MB line. I will provide scans of all the catalogs and take them apart in detail! But the dealer catalog is not the only evidence that supports the notion of two waves. The second fact that supports this is that the majority of the assortment numbers of the second wave are higher than the assortment numbers of the first wave. The first wave’s assortment numbers range from 9100 to 9116, the second wave ranges from 9123 to 9126 (with the exception of 2 assortments which got assigned unused numbers from the first range). Furthermore, as you can see, there is a gap between these two ranges. 9116 is the last assortment number of the first wave and then there’s a sudden jump to assortment number 9123 for the second wave. A third fact that supports the notion of two waves is the fact that Jetfire was initially labeled as leader of the Autobots in the absence of Optimus Prime. I personally believe that MB’s original intent was to only release what we now can refer to as the first wave. Because Optimus Prime was originally not part of MB’s plan, Jetfire would have been a logical choice for leader because of his size. Obviously something changed over time and a course change was effected, which saw Optimus Prime being added to the line up after all (along with a host of other popular G1 characters that were absent from the first wave). To me it is very clear that Optimus Prime was not part of MB’s original plan. 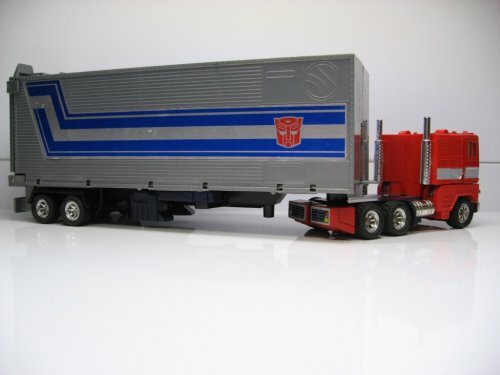 The fact that MB released Optimus Prime after all a few months later indicates there was a second wave. If MB would’ve had plans to release Optimus Prime from the start, he would probably have been leader of the Autobots and not Jetfire. As a kid, the MB line used to make me ponder. 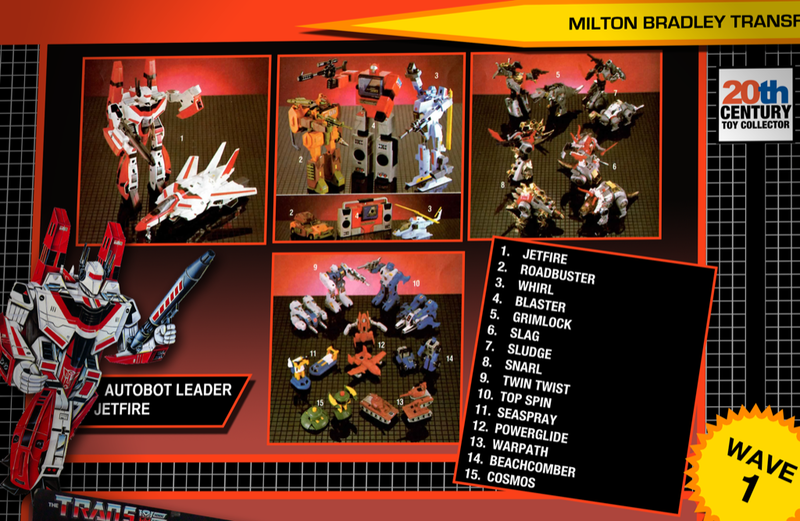 Why the hell was Jetfire leader? Where was Optimus Prime? Why was Tracks red? Why did Starscream look like Thundercracker? In order not to saturate your brain with too much information in one chapter, I have reserved a future chapter of this article series where I will go into detail on all of the mysteries of the MB line (and make an attempt to clear them up!) But for now, it’s good to at least enumerate the most important ones. First of all there’s that funky Jetfire vs Optimus Prime leadership thing going on. 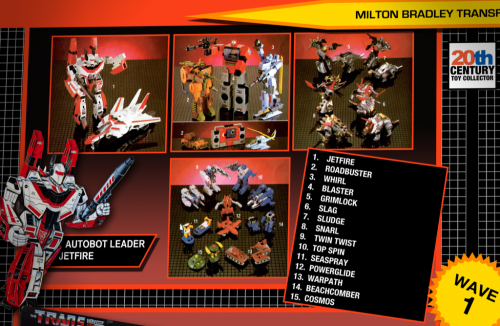 Jetfire is officially billed as the leader of the Autobots in all the MB catalogs. 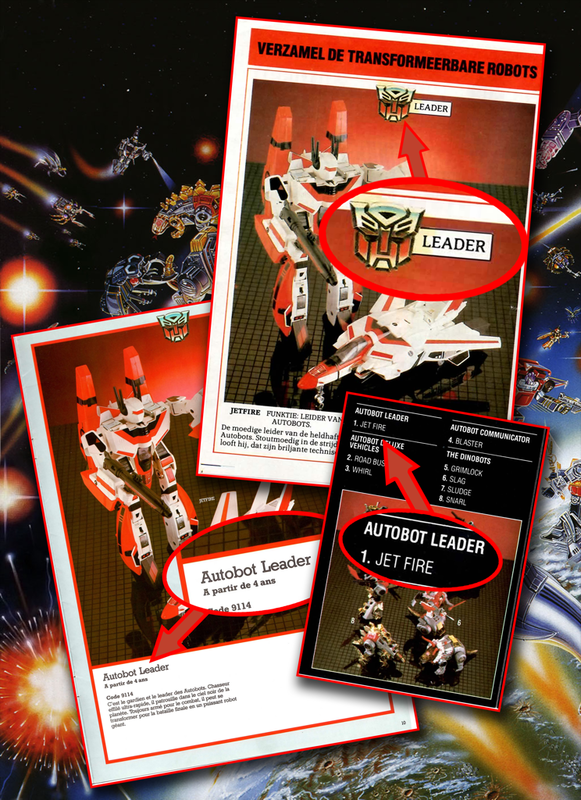 One of the catalogs even contained a mini comic where Jetfire is clearly leader of the Autobots. This whole Jetfire vs Optimus Prime thing turned out to be a total and confusing mess, even resulting in Optimus Prime temporarily being called Jetfire in Dutch translations of Marvel’s Transformers comics. There was an alledged trademark dispute in the Netherlands regarding the name Optimus Prime which might have had something to do with it. We’ll be looking at all that in a future chapter. But that’s not the only mystery surrounding Optimus Prime. The MB line introduced a true variant that has become very well known over the years amongst collector circles; the red foot Optimus Prime! Red seemed to be the rage in the MB line, because besides the red foot Optimus Prime, there’s another red variant that was introduced by MB and is now a highly coveted collector’s item: red Tracks! Another MB mystery that I remember well first hand, is the Thundercracker vs Starscream mix up. I remember going to my local toy store in 1985 at least once a week to gawk at the Transformers on display that I couldn’t afford. There was an MB Starscream for sale, but the toy inside the Starscream box was definitely not Starscream, it was Thundercracker! What makes this all the more interesting is that Thundercracker was never officially released as part of the MB line up. I’m sure you can imagine how confusing this all might have seemed to my 10-year-old mind back then! As promised, I will have a lot more details on these mysteries in a future installment of this article series. I have a special chapter planned that will be exclusively dedicated to all the mysteries and questions that surrounded the MB line. If everything pans out the way I have planned it, this will happen in part 6. However, you will not need to wait that long to solve some of these mysteries, because the next installment will already unravel some of the more enigmatic mysteries! And that concludes our look at the introduction of the MB Transformers line in Europe! We’ve seen that MB released what looks to be two waves of Transformers from July (wave 1) and October (wave 2) 1985 respectively, adding up to a total of 53 retail Transformers released under the MB banner. In the next part we’ll be revisiting our good friend, the Joustra Diaclone line. There’s a lot more than meets the eye going on there, which connects MB with Joustra. It builds on the information we have seen in the previous installments and will be the most interesting chapter of the series yet, because it explains so much of the how’s and why’s surrounding the MB line. 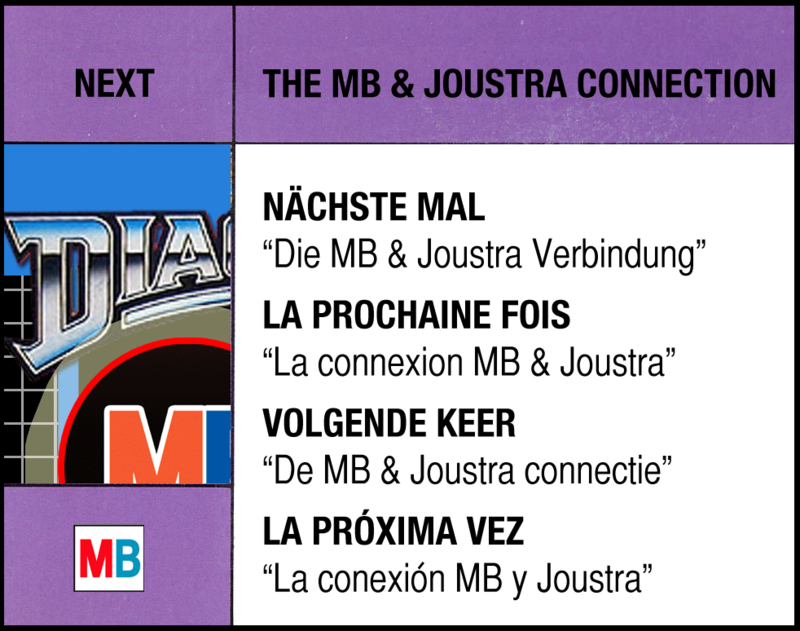 Lots of questions will be answered as we take a look at The MB & Joustra Connection! So stay tuned for the next installment! I am so glad I found this website, this is such rich and detailed information! Another wonderful segment, I highly anticipate the next! Yes! Truely magnificent stuff again. A delight to read. I’m so glad we still have 7 segments to go! I am so enjoying this. So, were Rumble and Frenzy never released in some Euro countries? That’s right! AFAIK, continental Europe did not get any other cassettes in the early years besides Laserbeak and Ravage and those are very rare if you do find them. I’m not entirely sure about the Nordic countries yet, but the countries covered by Milton Bradley did not get anything else besides Laserbeak and Ravage on solo cards. Great website! thank you very much for the detailed information. Greetings from Spain! So my recipe of the week comes from the seesixt chef on television Alton Brown. I love this dip, it is out of control good and you can add extra red pepper and spices to taste.1 cup thawed, chopped frozen spinach11/2 cups thawed, chopped frozen artichoke hearts6 ounces cream cheese1/4 cup sour cream1/4 cup mayonnaise1/3 cup grated Parmesan1/2 teaspoon red pepper flakes1/4 teaspoon salt1/4 teaspoon garlic powderBoil spinach and artichokes in 1 cup of water until tender and drain. Discard liquid. Heat cream cheese in microwave for 1 minute or until hot and soft. Stir in rest of ingredients and serve hot. You may have to microwave the dip again to achieve the level of warmth you like. I like birds eye artichoke hearts the best. I clean the choke part out before chopping. Serve with tortilla chips or bread. Don’t be fooled this is not traditional spinach dip so that Hawaiian bread crap while good is not the ideal accompany. Enjoy!